This rather unusual image was taken on the steps looking down into the main archway of the Menin Gate and dates from the early 1930s. The Menin Gate had been unveiled in July 1927 and within a year was the focus of Remembrance in the area with the nightly playing of the Last Post – something that continues to this day and was only interrupted by the Second World War. A small group of battlefield pilgrims can be seen looking around at the names; same no doubt veterans, perhaps others with a special name to see? A private, personal pilgrimage frozen in time. As the Germans were pushed back across Northern France in September 1944, they withdrew across the Belgian border but made little attempt to defend most of Belgium. Ypres was liberated by Polish Troops, part of 21st Army Group, on 6th September 1944 and that evening the Last Post was played at the Menin Gate; the great memorial to the missing which had remained silent to the sound of bugles since May 1940. From that evening when a new generation in khaki gathered round the buglers, the Last Post has been played every evening ever since; it recently celebrated the 29,000th playing. 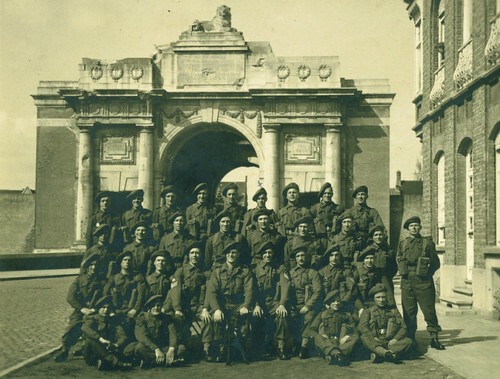 British units from 21st Army Group used Ypres as a base as Operation Market Garden took them into Holland, and this image shows men from a Royal Artillery unit gathering in front of the damaged Menin Gate in September 1944. The Gate had come under fire in May 1940 and been damaged when the road bridge in front had been blown by a Royal Engineers officer. The damage to it, repaired in the 1950s, is visible when the image is enlarged. This iconic symbol of the Great War battlefields was among the last major monuments to be liberated, as the old battlefields returned to the silence of peace that been theirs for the two decades before 1939. 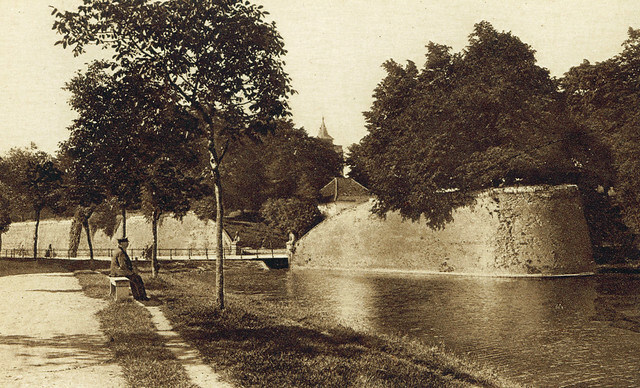 Made rich on the proceeds of the Cloth Trade, the city of Ypres fortified itself in the seventeenth century by engaging the military architect Vauban to build a huge star-shaped defensive wall around the city. The exits from the city were all so-called ‘gates’; gaps in the wall on roads leading to particular towns elsewhere in Flanders. 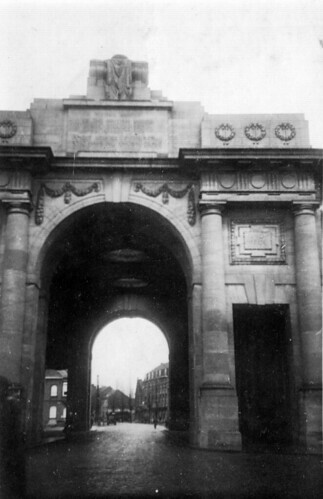 On the eastern side of Ypres was the Menin Gate, which lead to the town of Menin. Guarded by two lions, symbols of Flanders, by 1914 there was a pub built into the walls here much frequented by the locals. There was no physical gate or barrier, just a bridge across the moat. In 1914 British troops came to Ypres and marched through the gate and up to the Menin Road to take part in the First Battle of Ypres. It became a main thoroughfare throughout much of the next four years and like the Cloth Hall, for men who served in Flanders it was one of their landmarks. 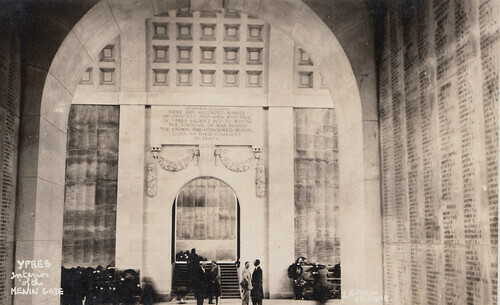 The Menin Gate’s landmark status continues to this day as post-war it was selected as the site for the Menin Gate Memorial, which originally commemorated nearly 55,000 soldiers who have no known grave. Unveiled in 1927 the memorial became a focus of remembrance as each night from the summer of 1928 the Last Post was played here; and it is still played here today at 8pm each night by the Last Post Association. This image of the Menin Gate in 1917 comes from an illustration done by an officer from the 9th (Scottish) Division in the summer of 1917. The division had been on the Western Front since 1915 and lost so heavily at Loos that one of its Brigade was replaced with South African troops. It had taken part in the bitter struggle for Delville Wood on the Somme in 1916 and in early 1917 made one of the longest advances in the opening phases at the Battle of Arras in April. 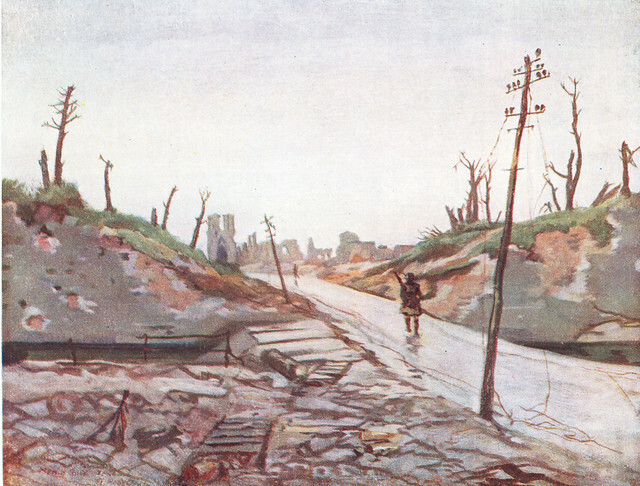 By the time it came to Ypres in the late summer of 1917 the rain had turned the battlefield into a quagmire, and for the men of the division this was their first encounter with the infamous city. 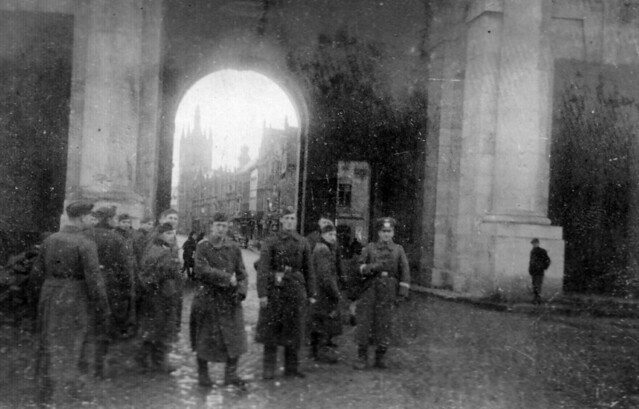 By then the Menin Gate – a gap in the city walls and a main route out of Ypres to the front line – had become legendary and the wartime phrase, no doubt soon familiar to the Scots was ‘will the last man through please close the Menin Gate’. 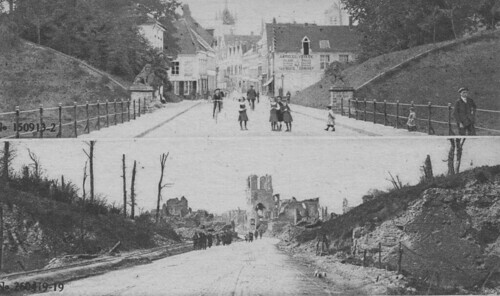 To the rear are the shattered remains of Ypres and the outline of the Cloth Hall; in ruins after three long years of war. Today the Menin Gate is world famous as one of the most important British and Commonwealth memorials to the missing; here each night the Last Post is sounded in memory of all those who fell. But few have seen images of what it looked like before the war. This unusual view is taken from where many modern visitors take photographs of the memorial; across the moat and looking back. In 1913 the Menin Gate was a gap in the Ramparts guarded by two Flemish Lions and took the traveller out of Ypres and onto the Menin Road; thus the name. 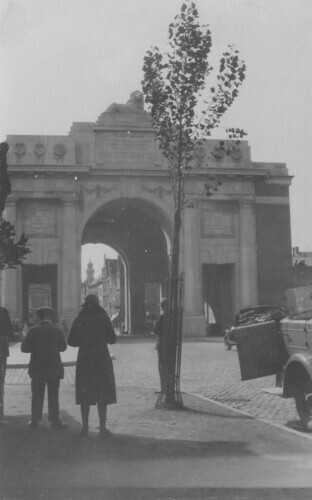 Little known is that there was a pub set in the gap that was the Menin Gate (sadly civilians were killed in it by shell fire in the early years of the war, their bodies not found until the memorial was built in the 20s) – and the roof of it is just visible. The two lions can be seen to the right of the moat bridge; both of these survived the war but were given to Australia in 1936 and today are in the collection of the Australian War Memorial. It is hard to believe that within a year of this photograph being taken Ypres was on the front line and the Menin Gate became one of the most famous – infamous – locations on the Western Front. The peace seen here would be lost forever and the name the Menin Gate would take on a new meaning as a place of remembrance and sacrifice.